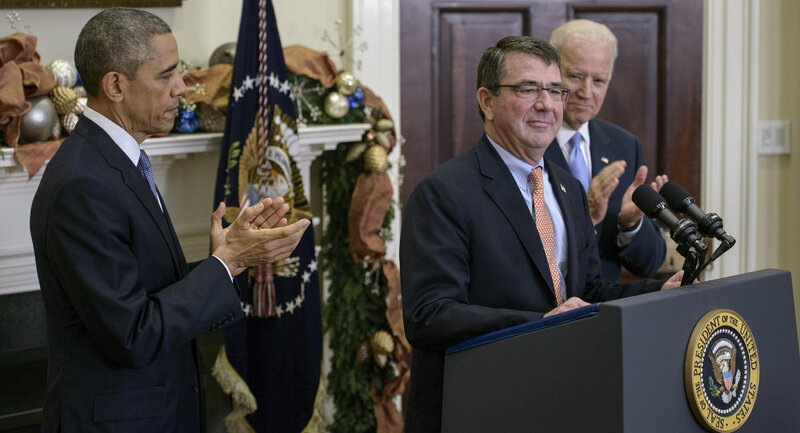 MOSCOW, February 1 (Sputnik) — Senate confirmation hearings are set to be begin next week for Ashton Carter, President Barack Obama's pick to replace outgoing Secretary of Defense Chuck Hagel. In addition to dealing with a wide variety of global challenges, from Ebola to the Islamic State and Afghanistan to China's growing military might, the big question in Moscow concerns what Carter's nomination will mean for relations with Russia. Specifically, Carter will be instrumental in determining whether the US decides to expand its military assistance to Ukraine, a conflict zone blamed on Moscow by Washington and Brussels. Carter, with his vast experience in dealing with post-Cold War Russia during the Clinton era, once touted a policy of "preventative defense," a concept arguing that cooperation, rather than confrontation, would allow the United States to meet the security challenges it faces in the world. During President Bill Clinton's first term, Carter served as the Assistant Secretary of Defense for Global Strategic Affairs, where he was instrumental in formulating Secretary of Defense William Perry's "preventative defense" attitude toward Russia. His role included the forging of defense and intelligence partnerships with Russia and other nuclear-armed states of the former Soviet Union, including Ukraine, Belarus and Kazakhstan. This included an initiative, known as the Nunn-Lugar program, for the US to provide financial and logistical assistance to these countries in exchange for the safe-guarding and destruction of nuclear weapons. Carter played a crucial role in convincing Ukraine's leadership to get rid of its nuclear arsenal. He also recognized 1990s-era Russia's wounded pride in a time of social and economic crisis and geopolitical retreat internationally. He proposed a shared early warning system with Russia, nuclear de-targeting, and worked to assure Russian soldiers a place in the Bosnian peacekeeping force. In Secretary Perry's time, countries of the former Eastern Bloc were encouraged to join NATO's Partnership for Peace initiative, a compromise to NATO membership that ensured a friendly relationship with Russia and assuaged the latter's fears of encroachment by the Western military bloc. In 1999, Carter and Perry co-wrote a book entitled 'Preventative Defense: A New Security Strategy for America,' which, based on policies the officials had implemented while in office, noted the need to help Russia establish a "self-respecting place…in the post-cold war world." Fearing the further degradation and descent into chaos of Yeltsin-era Russia, the book noted that the biggest fear to be faced was a Russia that "might descend into chaos, isolation and aggression," referred to as "Weimer Russia." In 2015, the challenge of Russia to be faced by Mr. Carter is very different. Russia today is a country which has found its place in the world, which has not been allowed to slip into economic and social paralysis, and which has partners and allies around the world, among them the other members of the BRICS countries. NATO's continued push to the East has left Moscow disillusioned regarding the prospects for a close partnership with that organization. The ongoing conflict in Ukraine, which Moscow considers to be the result at least in part of Washington's meddling, is another issue leading to growing distrust. These new realities are something Carter will have to deal with. The jury is still out on whether he will recall his "preventative defense" idea of the 1990s, or be forced to adopt the more aggressive line the Obama administration has taken against Russia.